Because I’m nothing if but honest, I have to tell you there were about fourteen working titles for this post. It’s the part I struggled with the most. Well, I actually struggled more with the decision that led me here, but it runs a close second. How does one own a cat? Cats can live for 21 years?! I was quite fond of that last one but I didn’t want to come across as … well, as bad as it makes me sound. I blame my friend Jill for this. You see, I was fortunate to enjoy a day off with Connor last week Friday. We arranged for a little playdate with his buddy Sage (and by default, Sage’s sisters). We arrived and the “date” quickly led to an injury. Of.course. My kid, who rarely finds himself in harm’s way, found a stick on his leg. Well, he found the stick after it had left a nice hole bearing a striking resemblance to the Grand Canyon down most of his leg. Did you see that show Skywire? Holy cow. Anyway, we bandaged him up like good mothers would with gauze-like stuff and Band-Aids. The Band-Aids were actually serving as tape. You would never know Jill is married to a first responder. Truth be told, the MacGyver style bandaging was my terrible idea. Not long after, the outdoor play subsided substantially and the girls were sharing how they swaddle and love on their cat, Bullet. Bullet was a cute cat but remember … I am not a fan of cats. I actually told Jill my favorite ‘i hate cats’ story about being at a small group meeting when the hosts’ cat jumped right on my lap at the dining table and I lost all ability to speak I was in such horror. They smell fear. I’m sure of it. She said, “Oh, you should totally get a cat. You would love it.” That’s neat, I thought. I wouldn’t love it. It would be just the opposite. Besides, I’m a dog person. I’m also not home all that often and I would feel really badly leaving a dog for long periods of time. But still, a cat? I don’t even know how to own a cat. That afternoon, we sought out different cat breeds to see which one might look tolerable. I didn’t see any. Connor thought they were all cute. Why wouldn’t he? He was obsessed. We drove on down to Pet Smart and saw two cats that would be part of an adoption event Saturday. The very first one we saw peeked at us with her bright green eyes and the rest? Well, you know what they say. Her name is Charlotte (but I like calling her Charlie; it just sounds tougher) and someone dropped her off at the Barry County Animal Shelter in what they call a ‘bin’. A bin. Lame. She may be two and she may also be a nice, well-behaved cat. Well, aside from the biting game she plays with me. I’m not a fan of that. After much Googling, I figured out a few things and so far we’re doing okay. I can’t wait until Connor comes home tomorrow so she can make her cute kitty sounds at him. I’m still trying to accept the fact that she could live for nineteen more years. 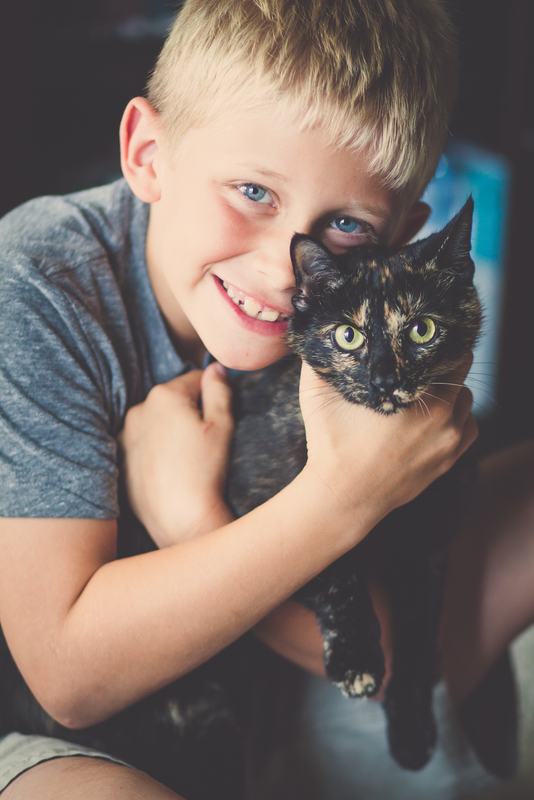 a boy and his … cat. This entry was posted in the best part of me and tagged absence of fear, appreciating the journey, cats, charlotte, connor, photography by staci. Bookmark the permalink. Aw so cute! CJ and Charlie = BFF! Yay for the new addition!